Windowboxes and Weissbier: You have come a long way baby! 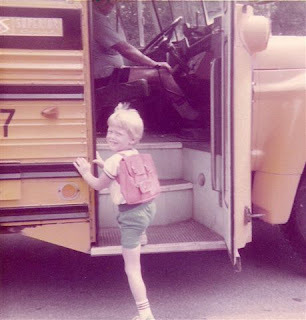 From the first day of kindergarten on the school bus all the way to 32 years old and working in Europe. Who would have thought? I think this is quite possibly one of the cutest pictures of my husband I have found in his mom's archives. I love it. I think he was the cutest kid and I think that he looks pretty much exactly the same now! I love the booty shorts and the little back pack. That picture had to have been taken 27 or so years ago. This morning Deaner left for his new job in Wiesbaden. He was a good sport and let me take a picture of him on the way out the door. So dumb, I know, but I had to. I was up at 5:00am this morning because a very loud dial tone kept sounding from what I am assuming was the room next door. That better correct itself because I am not sure I can take waking up that early again. It makes for a very long morning! Here is Deaner on his first day! Adults dressed up as life sized ANTS. I was warned that I would said "huh"? about a lot of things in Germany and so far a day hasn't passed when I haven't seen something abnormal such as this. In this picture they are taking a picture with some girl but when they were done they got up and started marching around to some music. ODD. Ok, well Deaner went to workout while I wrote this post but now I am going to lie down for a few minutes to rest before we venture back out. My anxiety level is starting to go back up because now that he is home I don't want him to leave again in the morning. I am a wimp, I know. I was feeling really sure of myself earlier because I thought Deaner had a meeting tomorrow at 2pm in our hotel so that he was going to be able to have lunch with me. Unfortunately it just got moved to Friday and so I'm not sure yet how I will fill my day! More later I am sure! Stay tuned! Oh my gosh those Ants were so weird! I've lived here for 7 months and every day I am amazed at the weird things I see! You can totally come hang out with me tomorrow! I am sure we can find something interesting to see. Cute pic of Deaner! Glad you had a good day. I want more pictures. How's the list coming? I love it.....and glad that you had a good day..............!!!!! I am jealous - what a wonderful opportunity you are going to experience!! Have you checked to see if there isn't an American Wives Club or something like that? We were supposed to move to The Hague (unfortunately it didn't happen). I don't know how, but I found the club in The Hague and it looked like they had some very neat activities, day trips, clubs, etc. to join. See if they don't have something like that.